You know how there are days when all you want is some comfort food, something simple, nutritious and light. A lot of times for me, those days automatically bring tomato rasam to mind. Rasam as I mentioned in my last post is a light soup like preparation made with tamarind juice, cooked lentils and flavored with spices like cumin seeds and pepper. It is served on a bed of plain steamed rice with a curry on the side. It is usually served as the second course in the traditional south Indian meal. Cook the soaked lentils in the pressure cooker until soft and mushy. (you can use the stove top for this too, it just takes a little longer) remove when done, mash it with the back of a spatula when still warm and keep aside. Press the soaked tamarind to extract juice and strain the juice into a small pan. Fill the bowl holding tamarind with water again and press the tamarind to extract juice from it yet another time. Repeat one more time, then discard tamarind pulp and seeds. Place the pan on heat, add salt to taste and rasam powder and allow to come to a boil. When it begins to boil add finely cut tomatoes and lower heat to medium or medium low and allow to simmer for a few minutes until tamarind loses its raw taste and tomatoes are cooked and soft. Add mashed lentils, water as required to achieve desired consistency, grated jaggery if using and allow to simmer for a few minutes until the flavors mingle. In another small pan, heat clarified butter or oil, add mustard seeds to it. 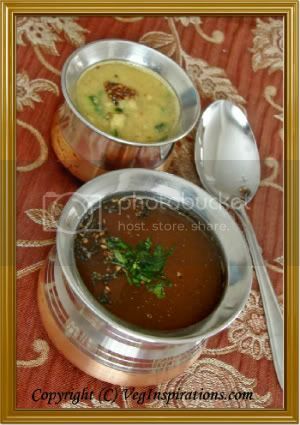 When the seeds begin to splutter add cumin seeds, when the cumin seeds sizzle remove and pour entire seasoning on the rasam. Remove from heat, garnish with cilantro and serve hot over a bed of plain steamed rice and a kootu or curry on the side. Using jaggery enhances the sweetness of the tomatoes and brings out the contrast between the sweet, tart and spicy flavors in the rasam. If not available it can be skipped, but adding it does make a difference and enhances the taste of the rasam.